There's just about something for everyone in today's batch of technology news, courtesy of our friends at TechRadar: news on HTC's budget handset, OnePlus' not-so-budget flagship smartphone, Google's popular browser, and Microsoft's signature laptop. Few modern-day computing problems are more annoying than having audio start blaring out from one of your browser tabs. Thankfully, the engineers behind Google Chrome have taken note – the browser will soon include a feature that blocks autoplaying video by default. You can also mute specific sites that are taking audio liberties by right-clicking on the relevant tab at the top and choosing Mute Site from the pop-up menu that appears. If you're keen to get in on the Surface Book 2 action, Microsoft just made it less expensive for you to do so. There's a new model on the market, with half the storage (128GB instead of 256GB) and a £350 price drop, so you'll only have to spend £1,149 if you think you can do with less local storage. You still get the same Intel Core i5 processor and 8GB of RAM under the hood, so it's still going to zip along, as you would expect for a £1,000+ laptop. Retro consoles and retro games are big business right now – in fact, retro anything is usually a good seller in 2018 – so it seems a suitable time for Atari to make its name known again. 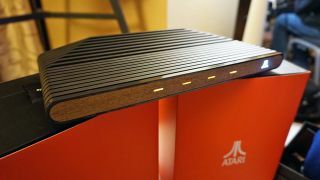 It's not bringing out one of its classic consoles though, but rather a brand new machine called the Atari VCS: we don't know an awful lot about it (it sounds like a compact Linux PC in a box), but we do now have our first real photograph of the console to gawp at. We've known about the standalone HTC Vive Focus for some time – HTC's cut-down VR headset that runs on mobile components – but we weren't sure what availability would be like outside of China. Well, HTC has now announced that the device is going global later this year, though we don't have exact details on countries, launch dates or prices. More details on the wire-free, compact virtual reality headset should follow in due course. We've already seen the Samsung Galaxy S9 and the Samsung Galaxy S9 Plus launch this year, but plenty more mouth-watering handsets are on the way for the rest of 2018 – including the OnePlus 6. The latest leaks about the phone from social media in China suggest the phone will attract a relatively high price, which is unusual for OnePlus: apparently it's slated for $749 (around £530) much higher than the £449/$499 OnePlus 5T.